This history of woodworking hand tools from the 17th to the 20th century is one of a very gradual evolution of tools through generations of craftsmen. As a result, the sources of changes in design are almost impossible to ascertain. Published sources, moreover, have been concerned primarily with the object shaped by the tool rather than the tool itself. The resulting scarcity of information is somewhat compensated for by collections in museums and restorations. 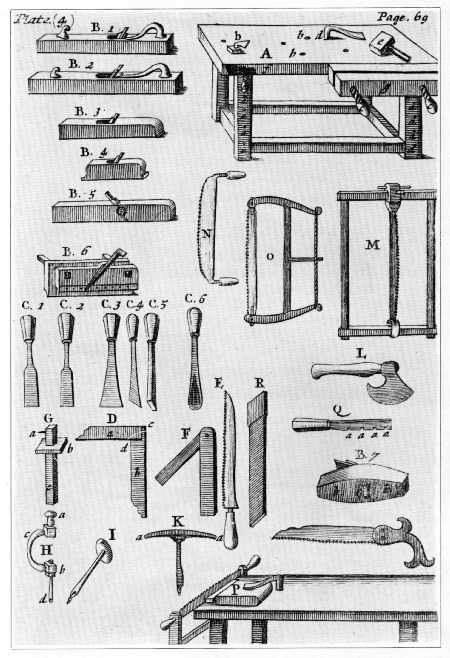 In this paper, the author spans three centuries in discussing the specialization, configuration, and change of woodworking tools in the United States. States, in the Smithsonian Institution’s Museum of History and Technology. In 1918, PROFESSOR W.M.F. PETRIE concluded a brief article on “History in Tools” with a reminder that the history of this subject “has yet to be studied,” and lamented the survival of so few precisely dated specimens. What Petrie found so discouraging in studying the implements of the ancient world has consistently plagued those concerned with tools of more recent vintage. Anonymity is the chief characteristic of hand tools of the last three centuries. The reasons are many: first, the tool is an object of daily use, subjected while in service to hard wear and, in some cases, ultimate destruction; second, a tool’s usefulness is apt to continue through many years and through the hands of several generations of craftsmen, with the result that its origins become lost; third, the achievement of an implement of demonstrated proficiency dictated against radical, and therefore easily datable, changes in shape or style; and fourth, dated survivals needed to establish a range of firm control specimens for the better identification of unknowns, particularly the wooden elements of tools—handles, moldings, and plane bodies—are frustratingly few in non-arid archaeological sites. When tracing the provenance of American tools there is the additional problem of heterogeneous origins and shapes—that is, what was the appearance of a given tool prior to its standardization in England and the United States? 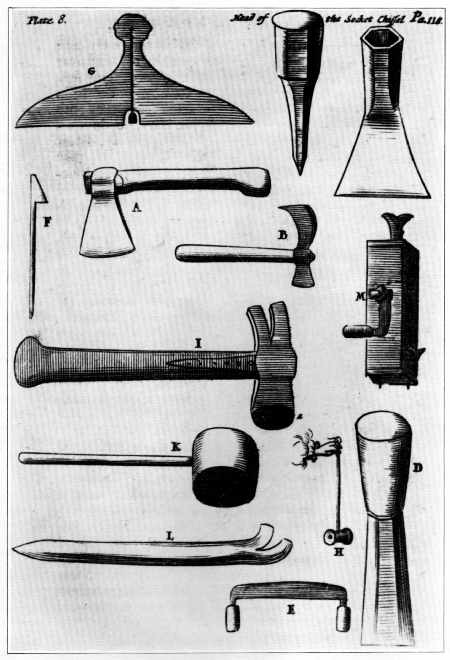 The answer requires a brief summary of the origin of selected tool shapes, particularly those whose form was common to both the British Isles and the Continent in the 17th century. Beyond this, when did the shape of English tools begin to differ from the shape of tools of the Continent? Finally, what tool forms predominated in American usage and when, if in fact ever, did any of these tools achieve a distinctly American character? In the process of framing answers to these questions, one is confronted by a constantly diminishing literature, coupled with a steadily increasing number of tool types. The most informative recent American work on the subject is Eric Sloane’s handsomely illustrated A Museum of Early American Tools, published in 1964. Going beyond just the tools of the woodworker, Sloane’s book also includes agricultural implements. It is a delightful combination of appreciation of early design, nostalgia, and useful fact. 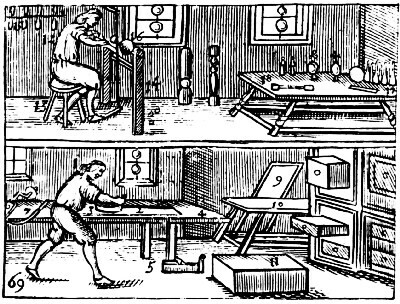 Charles Hummel’s forthcoming With Hammer in Hand: The Dominy Craftsmen of East Hampton—to be published by the Yale University Press—will be a major contribution to the literature dealing with Anglo-American woodworking tools. Hummel’s book will place in perspective Winterthur Museum’s uniquely documented Dominy Woodshop Collection. This extensive collection of tools—over a thousand in number—is rich in attributed and dated examples which range from the early 18th through the mid-19th century. The literature of the subject has been greatly enhanced by the English writer, W.L. Goodman. 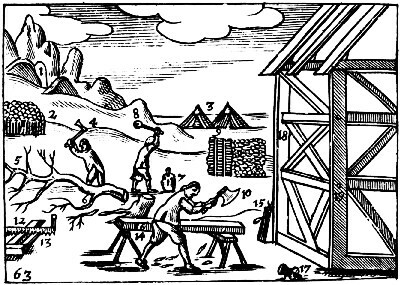 Extending a series of articles that first appeared in the Journal of The Institute of Handicraft Teachers, Goodman has put together a well-researched History of Woodworking Tools (London, 1964), one particularly useful for its wealth of illustration from antiquity and the Middle Ages.